Black Walnut Wooden Bowl, 12"
Black Walnut Wooden Bowl, 15"
When you purchase an heirloom quality wooden bowl you'll enjoy a functional piece of art for years to come. A lasting gift, wooden bowls recall shared family meals, fun gatherings, and happy times. 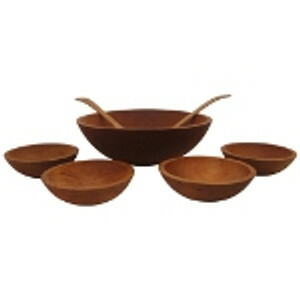 Here are some tips on buying the right wooden bowl for you. How can I tell if my bowl is #1 quality? It's very important to understand that not all handcrafted bowls are the best quality you can find. While all the bowls sold by The New England Trading Company have been examined and identified as #1 quality by our artisans (unless specifically identified otherwise in our #2 quality shop), many other retailers sell #2 or #3 quality bowls without comment. These bowls will likely have more wood issues such as knots or fine cracks. Always ask for #1 quality when looking for a bowl to last a lifetime. How are your bowls handcrafted? Our wood bowls are the highest quality available, each handcrafted by skilled craftsmen using a single piece of premium hardwood. To start, large logs are cut into manageable sections and then the appropriate shape and size to fit a large lathe. Repeated cuts on the lathe produce bowls from 17" across to 9" across. To reduce scrap, cutting is planned so that the majority of wood from one block becomes a bowl. Bowls smaller than 9" are cut on a smaller lathe. Once cut each bowl is dried on racks for 20-30 days. Once dry, they are hand sanded on the inside and outside, and a flat bottom is added. Next, they are individually inspected and graded and bowls that pass inspection are hand rubbed with a natural food-safe preserver made of beeswax and mineral oil. This process enhances the grain and brings out a natural sheen. The bowl is placed on a drying rack and once dry, is ready for your home. Are any stains or chemicals involved? Our bowls are naturally beautiful and free of wood stains and chemicals. 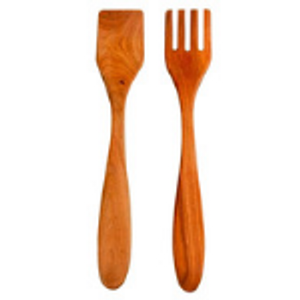 Their warm glow comes from the quality of their cut, wood species, sanding, and treatment with wood preserver. How do I care for my bowl and do I need any special handling before first use? 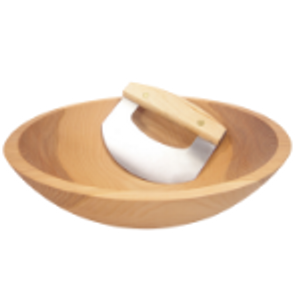 Because your bowl has already been treated with our food-safe wood preserver you can use it right out of the box. Simply hand wash in warm water using a small amount of mild soap and a non-abrasive cloth. Hand dry. How can I keep my wood bowl looking beautiful for years? A little TLC goes a long way. Always hand wash and never, ever soak wood products in water or let water stand inside the bowl. Long exposure to water will warp or crack any wood bowl. Never use the dishwasher or microwave or conventional oven. Don't leave in direct sunlight for long periods of time. Do retreat your bowl with our food-safe wood preserver occasionally (use it on all of your unfinished wood bowls and utensils). All wood items need a protective coating to avoid drying out, cracking, and warping, and to avoid staining. When the wood appears dry or about every other month apply a coat of preserver as directed on the package. One tub will last you for years! Never use vegetable oil to protect your wooden bowls and utensils, which builds up over time and can leave the wood tacky and rancid. Vegetable oil creates a breeding ground for bacteria. Will my bowl darken with age? Yes, all wood bowls will darken over time. You'll enjoy a deeper, rich color if properly maintained. Wood is know for it's natural beauty and each species has its own unique set of characterisitics and variations in grain pattern, texture, and color. Hardwoods are deciduous trees that have broad leaves and produce a fruit or nut. Popular North American hardwoods include cherry, maple, oak, honey locust, black walnut, birch and ash. Each species can be crafted into long-lasting durable kitchenware, flooring, furniture and more. Softwoods, or conifers, include cedar, fir, pine, redwood, and spruce, These are primarily used as structural lumber. Which hardwood should I choose for my bowl? 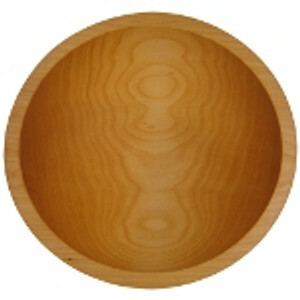 Cherry: The most popular bowl choice, cherry is known for its rich, warm color. Like all fruit trees, it belongs to the rose family. It was heavily used by American Colonists and is sought after in antique bowl collecting. Cherry grows primarily in the Eastern U.S. The heartwood varies from rich red to reddish brown and darkens with age. It features a fine, straight grain and satiny smooth texture. May naturally contain brown flecks. Hard (Sugar) Maple: Tapped for the sap that produces maple syrup, sugar maples primarily grown in the Eastern U.S. and favors a cold climate. 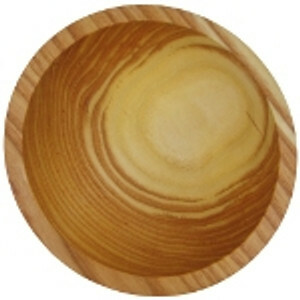 Very strong and durable, maple is a great choice for chopping blocks and cutting boards. 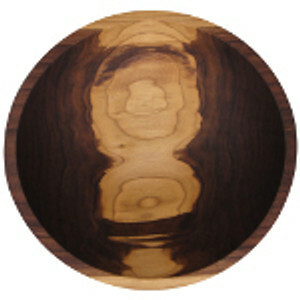 The sapwood is creamy white with a slight reddish brown tinge and the heartwood runs from light to dark reddish brown. Typically the bowl appears lighter in color than a cherry bowl. The grain is fine and generally straight, however it can also occur wavy. Black Walnut: Grown primarily in Eastern U.S. a black walnut tree can reach heights of 100-150 feet. The heartwood is light to dark chocolate brown and occasionally takes on a purple or plum hugh. A rich patina develops with age. Walnut can have both a straight and wavy grain. Honey Locust: A very hard, dense wood with gorgeous natural swirls and patterns of creamy light wood with rich honey-tone to reddish brown wood. Honey Locust creates beautiful, interesting looking bowls that are not often seen elsewhere. Honey Locust is not as commonly available as most other hardwoods. Red Oak: An abundant tree that grows widely through the Eastern U.S. It features a warm reddish brown appearance with an interesting dashed grain. Red oaks have been used for everything from railroad ties, to barrels, furniture, and floors. Beech: Grown in the Eastern U.S., the beech tree has an average height of 120 feet. A very hard wood, it is often used in furniture and flooring. It generally produces a light tan colored bowl, althought at times youc an see a red tinge. 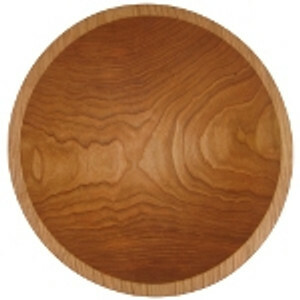 A great bowl for chopping salads, beech will stand up to the mezzaluna.